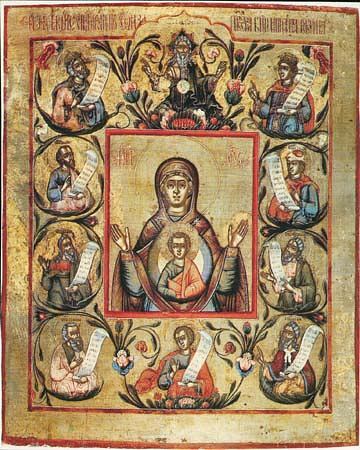 The Kursk Znamenie (Sign) Icon of the Mother of God – is one of the most ancient icons of the Russian Church. In the XIII Century during the time of the Tatar invasion, when all the Russian realm was put to the extremest tribulation, the city of Kursk, ravaged by the Horde of Batu, fell into desolation. One day in the environs of the city an hunter noticed the ancient icon, lying on a root face downwards to the ground. The hunter lifted it and saw that the image of the icon was similar to the Novgorod "Znamenie" Icon. With the appearance of this icon immediately there appeared its first miracle. Just as the hunter lifted up the holy icon from the earth, right then, at that place where the icon lay, gushed up strongly a spring of pure water. This occurred on 8 September 1259. The hunter decided not to leave the icon in the forest and settled on as a resting place an ancient small chapel, in which he put the newly-appeared image of the Mother of God. Soon inhabitants of the city of Ryl'a heard about this, and being in location not far away, they began to visit the place of the appearance for venerating the new holy image. They transferred the icon to Ryl'a and put it in a new church in honour of the Nativity of the MostHoly Mother of God. But the icon did not long remain there. It disappeared and returned to its former place of appearance. The inhabitants of Ryl'a repeatedly took it and carried it to the city, but the icon incomprehensibly returned to its former place. Everyone then realised, that the Mother of God preferred the place of appearance of Her Image. The especial help granted by the Mother of God through this icon is bound up with important events in Russian history: with the war of liberation of the Russian nation during the time of the Polish-Lithuanian incursion in 1612, and the 1812 Fatherland war. From the icon several copies were made, which also were glorified.